Coco, Mariebelle, and I are ready for dinner! My friend Coco is truly a quadrouple threat. She’s not only an immensely talented composer, musician, and painter, but she is also a FIERCE cook. She grew up in Vietnam and learned to cook all the traditional Vietnamese recipes from generations of women in her family— some of the recipes she’s taught me come from her 95 year-old grandmother! Whenever Coco offers to cook with me, I jump at the opportunity. Not only do I know that the food will be out-of-this-world, but I also learn so much every time I’m in the kitchen with her. Boy, do the Vietnamese know flavor! 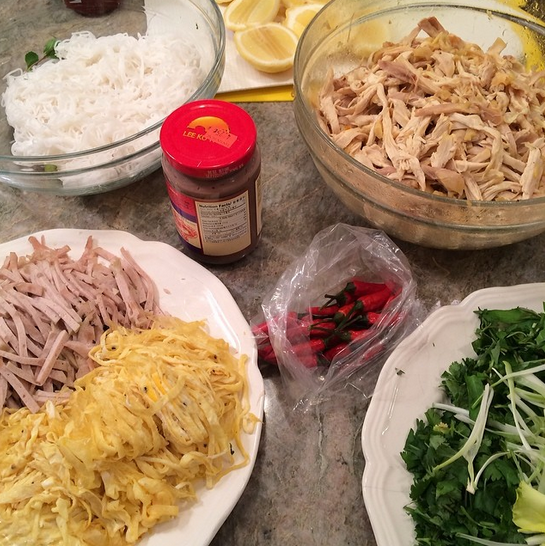 A few weeks ago, we put together a Pho dinner party. It was no easy feat! Pho broth has to simmer for HOURS, and is so much more complex than your traditional beef broth. The final product was amazing, but for dinner party #2, we decided to do something a little simpler. Coco offered to make her famous summer rolls and a Vietnamese chicken noodle soup. I made a Thai Beef Salad and, naturally, a chocolatey dessert. 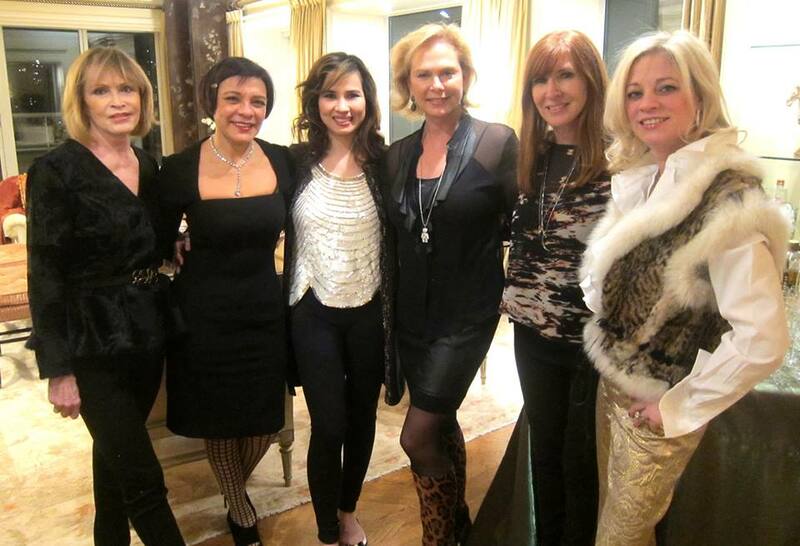 Overall, the party was a huge success! 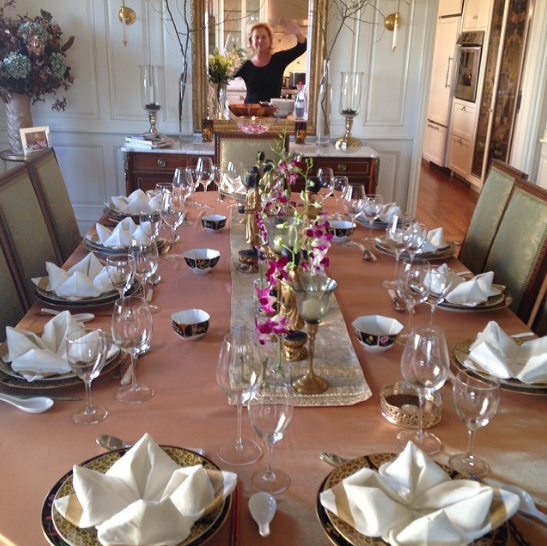 Let me show you how it all came together, from the table setting to the recipes! Next, Coco came over and started prepping the ingredients she brought over from Chinatown. You can find the most gorgeous produce and (organic!) meats in that part of town. The prices will stun you. Such bargains! She brought over rice noodles, chickens (heads intact! ), Vietnamese pork sausage, shrimp paste, chilies, and a slew of Vietnamese herbs. Shiso, cilantro, Thai basil, Vietnamese mint, and more! 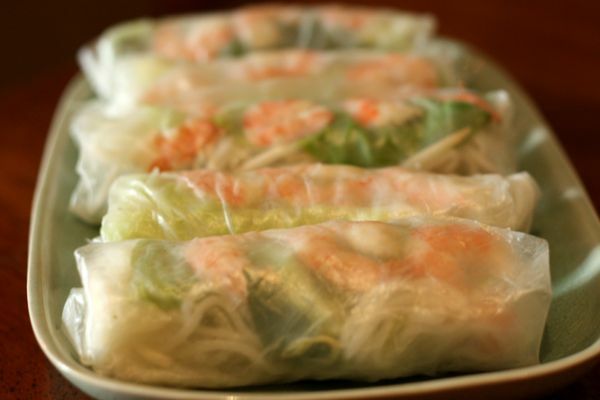 Because they’re everyone’s favorite, we made some Vietnamese summer rolls. Coco makes these in seconds flat. Hers look perfect, and mine look lumpy and weird. Oh well! Here’s the recipe. It’s the spicy sauce that really takes these to the next level! 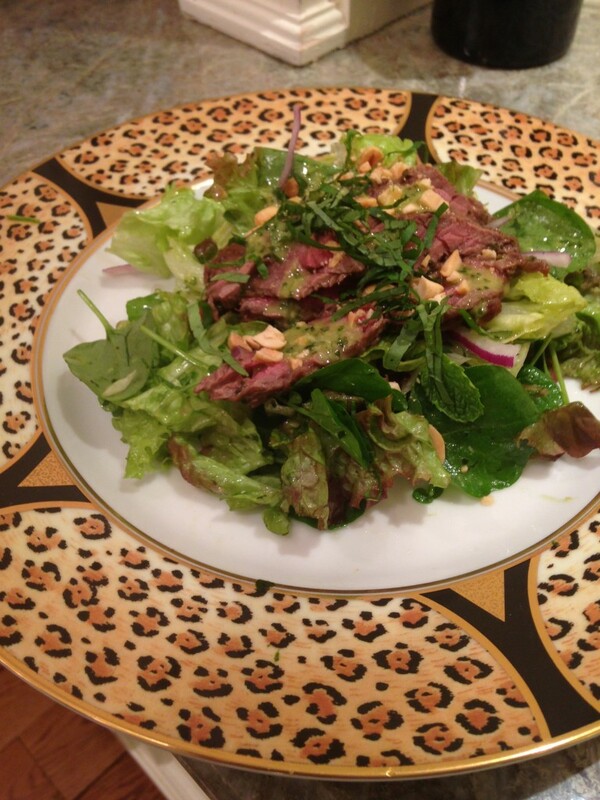 After the summer rolls were served, I served a twist on the Thai Sizzling Beef Salad from my cookbook. The original recipe calls for flank steak, but I used skirt. The steak gets marinated in a mixture of fish sauce, soy sauce, garlic, ginger, lime, cilantro, and mint before it’s grilled. I sliced it up over greens and drizzled it all with a bit of reserved marinade. Just herbs and crushed peanut to garnish! Light and delicious. Now for the main attraction! Coco’s Chicken Noodle Soup! 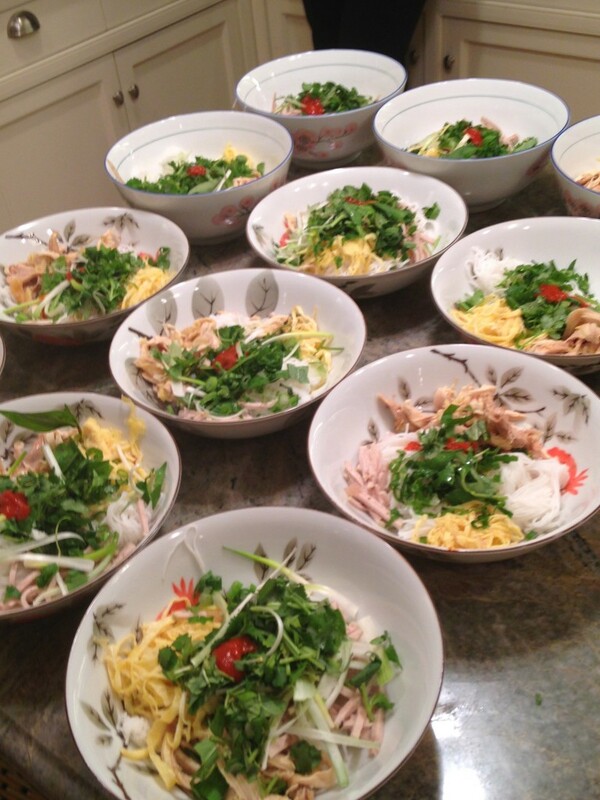 While her homemade Vietnamese chicken broth simmered, she assembled each bowl full of ingredients. In went rice noodles, sliced egg crepe, sliced pork sausage, shredded chicken, chili sauce, shrimp sauce, lemon juice, scallion, mint, basil, and cilantro— Wow!!! Once the broth is added, everything gets hot and the flavors all come together. It was absolutely divine. Definitely not the chicken noodle soup you’re used to! For dessert, I stuck to my trusty Chocolate-Almond Cake. It’s my #1 crowd-pleasing recipe. It’s so simple and I never worry about how it will turn out. Perfect every time. I served each slice with a little mango sorbet, whipped cream, and berries. I didn’t think I could possibly eat any more, but somehow I made room for dessert. It was the perfect end to our meal! All the girls! 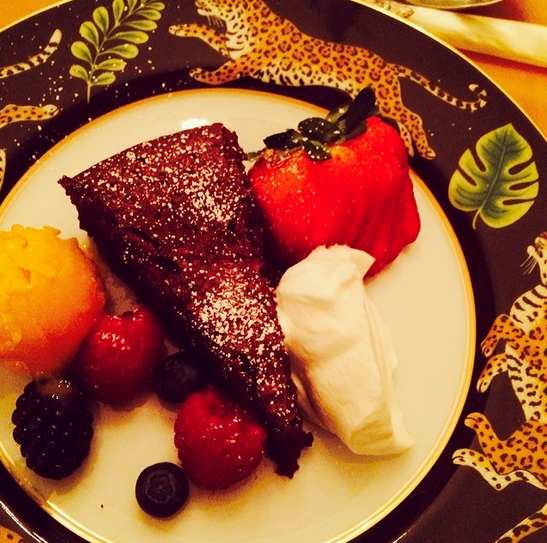 We had a great night– Nicole Miller loved our chocolate cake so much she even made it at home later! How are your Vietnamese cooking skills? Don’t worry, those summer rolls are great for beginners. Give them a try! Want to learn more? How about a Saigon Nights themed FWF cooking party? Sounds like fun to me! 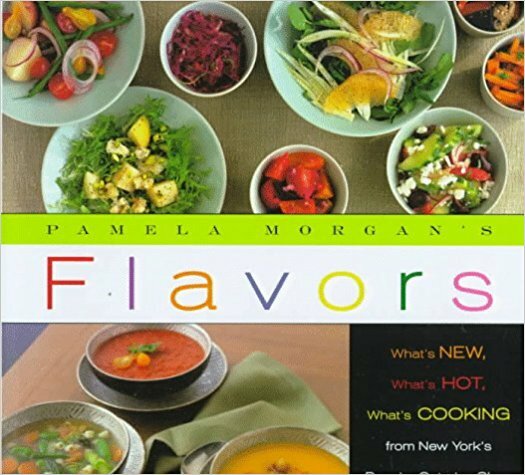 Send me an email at pamflavors@aol.com to make it happen.